Six visionary medical research and educational organizations partnered to form the Francis Crick Institute, Europe’s largest and most ambitious biomedical research facility. The partnership includes the Medical Research Council, Cancer Research UK, the Wellcome Trust, University College London, Imperial College London and King’s College London. Located in central London, the steel, glass and terra-cotta clad building occupies a full city block and creates strong architectural links to historic local buildings. Large cantilevered bay windows and tall glass atria reduce the building’s impact at street level and maintain natural light in workspaces and public areas. To reduce its visible mass, one-third of the structure is below ground, while the curved roof presents a gentle face to the community. Breaking with traditional governance and tenure structures, the Crick represents a major paradigm shift for biomedical research in the global scientific community. Its researchers are free to follow their own instincts and direction, with no departments or tenure. Almost no idea is off limits, and there is only limited intellectual property. Discoveries are shared openly with the rest of the world. To promote this innovative approach, the design creates easily adaptable and multidisciplinary research environments. The building can flex to meet its inhabitants’ continuously changing needs. The concepts of visibility and collaboration are central to the design. The building is composed of four blocks separated by a main east-west atrium and the smaller north-south transverse atrium. The main atrium’s cathedral-like scale is interrupted by the transverse atria where, on each level, one-third of the floor area is left open to create a double-height relationship with the adjacent floorplate and provide strong visual connections between floors. The junction of the two atria is dedicated to informal collaboration, breakout and administrative support spaces—all connected by a continuous open stair. The linear arrangement of lab neighborhoods optimizes visual permeability, offering views across the atrium into the write-up areas and through the primary labs. These lab neighborhoods can support rapid reconfiguration as research programs change. A centralized service distribution system enables a kit-of-parts approach in which predetermined components can be plugged into service spines in different combinations. 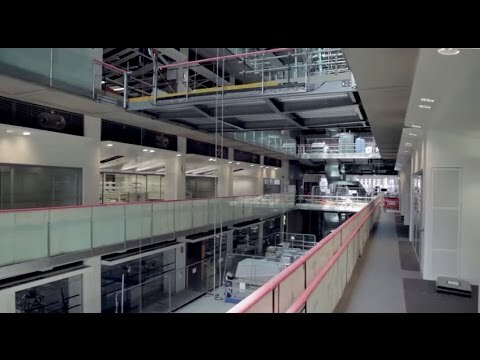 The scope and range of the Crick’s core facilities, which house services and technologies used by the entire research community, are unique. The proportion of shared core areas to primary and secondary lab facilities is nearly 50 percent—significantly higher than what is found at most research facilities. The building site is in the heart of central London’s existing scientific community, where it anchors a local hub of research facilities. These proximities fuel collaboration and innovation. Among the technical challenges was designing for sensitive lab equipment on an urban site. Special design measures provide equipment bases that achieve near-zero vibration criteria. The building was certified BREEAM Excellent for environmental sustainability. HOK served as architect and ‎lead designer responsible for the project’s overall design concept, interior design, lab planning and landscape architecture. PLP collaborated with HOK in shaping the building’s distinctive form and striking architectural expression. R&D Magazine named the Francis Crick Institute its 2017 Laboratory of the Year. 980,000 sq. ft. / 91,000 sq. m.
The Francis Crick Institute in London has been named R&D Magazine’s 2017 Laboratory of the Year. Construction is complete on London’s 980,000-sq.-ft. Francis Crick Institute, which brings together scientists from across disciplines to address the urgent health concerns of the 21st century. HOK’s design team leveraged the power of BIM for the design of London’s Francis Crick Institute. WIRED explores how the design of the Francis Crick Institute in London encourages collaboration and interaction among multidisciplinary researchers. The HOK-designed Francis Crick Institute in London will be “the largest single lab in Europe” and “is set to change the world,” says Dr. Sam Godfrey of Cancer Research UK. Occupying an entire city block, the steel, glass and terracotta-clad Francis Crick Institute will open in London in 2016.